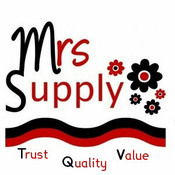 Mrs Supply sells quality ribbons, gift wrap supplies, packaging supplies, beads, and other supply items. Mrs Supply is proudly owned and operated by a wonderful blind woman, Jennifer K. O'Hara. Please support the blind. MrsSupply doesn't have any items in their booth! Jennifer@Mrs Supply is the real deal. She is one of the nicest people on Bonanza and goes out of her way to provide superb customer service. I consider her a treasured friend. Jenn is an amazing person. She has been so kind to me from the day I met her here on Bonanza. She has a great personality, and brings a smile to my face with her kind words. She is an absolute pleasure to work with, and a great person to have as a friend. What can I say about Jennifer that haven’t been already said ??? All I can say from my own experience, she’s and angel ! She made my 1st year here on Bonanza very special and most definitely very memorable… I will forever be grateful !!! Love you Jenn and wish you all the best in the world since I don’t know anyone else who deserves it more ! Jennifer started out as my “promoter” for my booth, but now I believe I would call her a great friend! She really takes care of me and my booth, and she’s such a sweetie! You will be very happy with her promotions! Jenn @ MrsSupply is an Awesome seller, customer and long time friend! So glad to have found her here on Bonz! She has great quality ribbons and crafting supplies at reasonable prices! She is a major asset to Bonanza! MrsSupply, Is a SUPER Amazing Friend. Very Very SUPPORTIVE here on bonanza and a Great Seller. Always adds that special THOUGHT in all her delivery packages. it’s like CHRISTMAS when you shop with her. And Is recommended to all she’s AMAZING! It’s been my pleasure getting to know Jennifer – very professional, great communicator, wonderful customer service and Bonz friend. What an absolutely wonderful person to deal with! She is very thoughtful in her packaging so as not to damage the product, and is very customer oriented. Good prices, quality products, an honest, friendly and thoughtful seller—you can’t ask for anyone better than Jennifer to deal with! Thank you Jenn!